At the top you find a select dropdown to select the view of a Fancy Product you would like to edit. You can also use the built-in search in the dropdown to search for a particular view. After that you are able to select the element from the items list in the Manage Elements section or click on them in the Product Stage. You can lock/unlock each element for editing when clicking the lock icon. 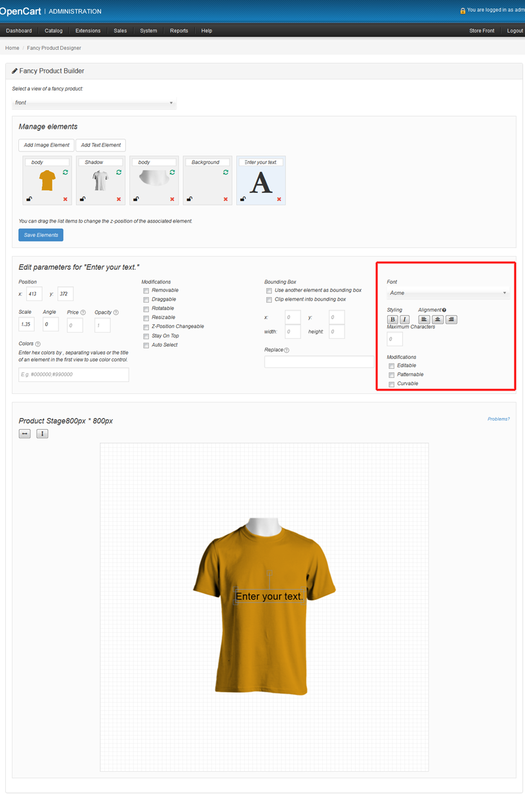 This is very useful when editing the elements and you would like to select one from the product stage, but over that element is another element. So when you lock one element to prevent editing, you can select the subjacent elements easily. To change the z-position of the element, you have to drag the associated list item to the desired position. When you change that position, you are going to see the changes in the product stage. Here you can change the parameters for the selected element. You can change the position, angle, scale also via this form. If you can’t touch an element from the product stage after adding it, save the elements and try it again. This is an exact copy of the product stage on the frontend. It has dimensions you set in the settings. You can also select an elment for editing from here.